Limerick-born singer, banjo player and guitarist Mick Moloney made his name in the 1960s as a member of The Johnstons, perhaps the most leftfield of all Ireland’s ballad groups – another member was Paul Brady. Long domiciled in the USA, where he has gained a substantial reputation as a musicologist, Moloney’s own recording career has been sporadic and this is his first album proper for some considerable time. 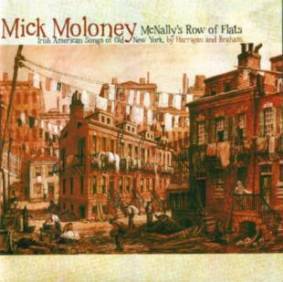 Over the years Moloney has consistently championed the cause of Irish music in the USA and his 2002 book Far from the Shamrock Shore focused upon the songs his country’s emigrants took with them across the Atlantic (and included examples on an accompanying CD). In the latter part of the nineteenth century Irish performers played a significant part in the popularity of vaudeville and McNally’s Row of Flats pays homage to two of Tin Pan Alley’s most accomplished songwriters, Ed Harrigan (of Irish descent) and the English-born orchestra leader David Braham. The pairing combined on numerous songs which Harrigan himself popularised on stage with his partner Tony Hart (not the TV presenter/artist of ‘Morph’ renown!). McNally’s Row of Flats presents fourteen of these songs in exemplary fashion. As far as possible Moloney has resisted the temptation to tamper with the original arrangements and his somewhat rustic tones are ideally suited to comic songs such as Never Take the Horseshoe from the Door, replete with superb brass backing, or I Never Drink Behind the Bar in the company of a frisky pair of fiddles. Complete with a highly detailed liner booklet, this an ideal album for singing along to in the shower or car. Written by Geoff Wallis for Songlines magazine – www.songlines.co.uk. Click here for more information about Compass Records.